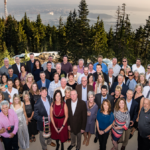 Top Performing Garaventa Lift dealers were recognized during the Top Performers Dealer Meetings held in Vancouver, Canada. This year Mobility Concepts was ranked #7, among Garaventa Dealers world wide. A sincere thank you to everyone that has helped to make our company a success through out the years. Top Performing Garaventa Lift dealers were recognized during the Top Performers Dealer Meetings held April 22-26, 2017 at Dreams Playa Mujeres near Cancun, Mexico. Thank you to Garaventa for a great trip and thank you to our customers. A special thank you to all our employees…we couldn’t do this without you! Thank you to our customers and staff for another great year. Garaventa Lift has a long-standing reputation as a world-class manufacturer specializing in compact elevators, home elevators, inclined platform lifts and vertical platform lifts and we are once again honored to be among the best dealers worldwide! For the second year in a row, Mobility Concepts receives Top 15 Performers Award from Garaventa. Thank you to all of our customers and employees who helped us get here! We are honored to be included in this elite group of only 15 elevator dealers worldwide.